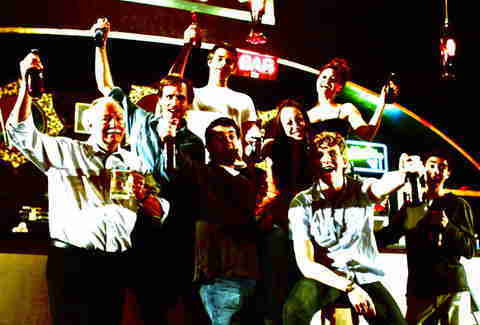 A lot of things can go down in bars, from high-fiving and fighting, to getting high with Five for Fighting, which'll actually just bring you down. 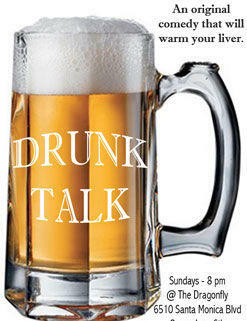 For a show founded in a bar, and going down in one too, check Drunk Talk, opening next Sunday. Taking place at a bar, DT's a semi-improv'd, interactive show from the director behind Point Break Live! and one of Rules of Engagement's writers, who ironically met at a watering hole and made a plan to work together because the writer actually had his script with him, which was actually for Predator, but they figured out something new anyway. Booziness is encouraged, with participatory shots actually worked into the plot, which revolves around the last night at a soon-to-shutter local-favorite pub, featuring regulars dispersed through (and interacting with) the audience, meaning that archetypical barflys are either your fellow show-goers or actual actors, including the prototypical old dude w/ crazy opinions, an entrepreneurial bartender, and a Hollywood club-goer just out to pick up drunk chicks, which's especially hard, since the dude's hella skinny, and doesn't even focus his routine on incline bench. Lest actual-funniness be your concern, the cast's all plucked from hilarity, with members having done time at Second City, Upright Citizens Brigade, SNL, and House, aka The Holy Trinity of Comedy... and SNL. The principals could make a new deal after the show runs for its scheduled eight weeks, which will probably extend it to some amount caught in between 10 and 20...and they're just dreaming, counting the ways to where you are!